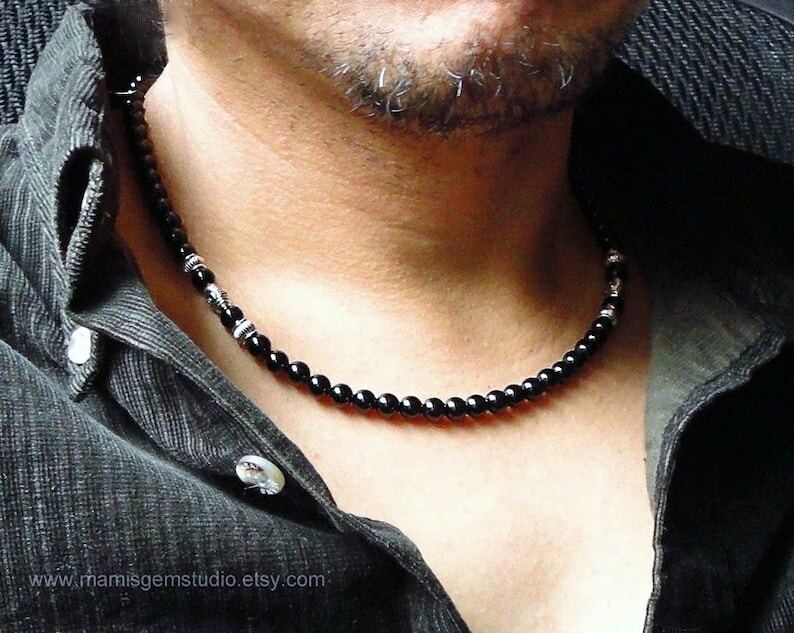 This handsome men's necklace was made with genuine Black Onyx gemstone well-polished high quality beads. I added antiqued silver finish pewter beads to accentuate the necklace, and finished off with a stainless steel lobster clasp. All metal materials are lead-safe. ❥ With a "Hand Made in USA" label attached to each piece of jewelry, your order will arrive in a gift box. - Please read my store policies and be aware and prepared for possible IMPORT DUTIES, TAXES & OTHER FEES that your country might charge you. Good quality and fast shipping!!! Personalised, caring service, beautifully wrapped gift. Prompt postage. It's beautiful, it comes in a nice package and it's very fast, it's perfect. Thank you. Fast shipping, handsome necklace great fit.